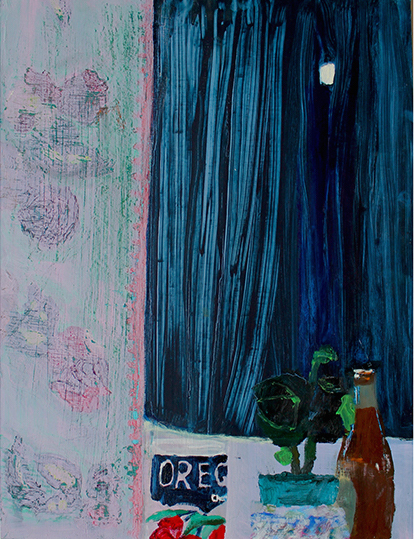 AUBREY LEVINTHAL: Velvet Moon, oil on canvas, 22" x 18"
a group exhibition of paintings curated by our newest co-director, Lauren Whearty. This exhibition includes Aubrey Levinthal, Kelly McRaven, Dustin Metz, Jason Mones, Jennifer Packer, Eleanor K. Ray, and George Rush. The act of painting a window-view is an unabashed celebration of the best of painting. Time, materiality, subjectivity, are all present within the narratives. There are few subjects more traditional to painting, and yet it has endless possibilities. A painting of a view outwards can carry with it a multitude of meaning, emotion, and visual/tactile pleasures. Most of all it is a dialogue with the practice of painting, image making, and our practice of painting on (for the most part) a window frame stretched with canvas. Leon Battista Alberti asked his audience to perceive the painting, and its underlying structure, as a window itself. This 15th Century metaphor may seem antiquated, yet these artists show us that within this concept there is so much potential. Within Frame Work these settings range from those based on memory, to those directly observed, to inventions and reconstructions of ideal or imagined spaces. Each artist works through this motif in order to dig deeper into their own practice. Kelly McRaven’s employs physical divisions as a way to use many styles or variations within one painting, while Jennifer Packer’s careful insertion of breath into each painting displays her touch and hints of air movement. Jennifer Packer employs narration in a figurative way, while George Rush implies it through much more subtle means. Dustin Metz and Aubrey Levinthal flirt with more gestural abstraction through their use of tactile experimentation and Eleanor K. Ray navigates memory through use of the grid and color to evoke light’s ethereal, emotional and temperature qualities. When we approach a window and its frame, we look through rather than “at” it. The experience of a painting is a look into and through the surface, beyond the obvious, which allows for painterly metaphor, for any number of our experiences and reflections. These opportunities are what allow painting to transport us as artists and viewers. When looking “at” a painting one does not just look at the image, but into the painting – the surface, the actions and gestures of the painter – and into the content of the image and materials. The layers of space, textures, and framing are undeniably a painter’s language.